The streets and rails of a city are its gravelly lifeblood. Its effects are a yin-yang of fates: an orderly transit network bolsters a city's legacy as a bastion of efficiency while a tangled mess of concrete and girders plunges a populace into chaos. 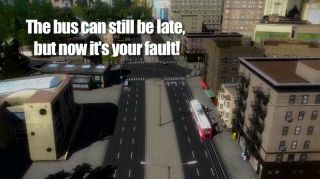 Choose wisely, because you're given overlord powers of transportation authority in Cities in Motion 2 , and as publisher Paradox's launch trailer warns, screw-ups sit squarely on your head. Cities in Motion 2, like its older sibling, focuses your tasks on constructing and improving road and rail networks. City growth and building layouts are all automated, so that frees up extra time for you to ensure everything running on wheels does so smoothly—or cackle in glee as clueless drivers fall into your Mobius highway trap. It's all at your fingertips for $20 on Steam , and I hope to soon see some crazy constructions rivaling the competition .